measuring in at 40" x 60". 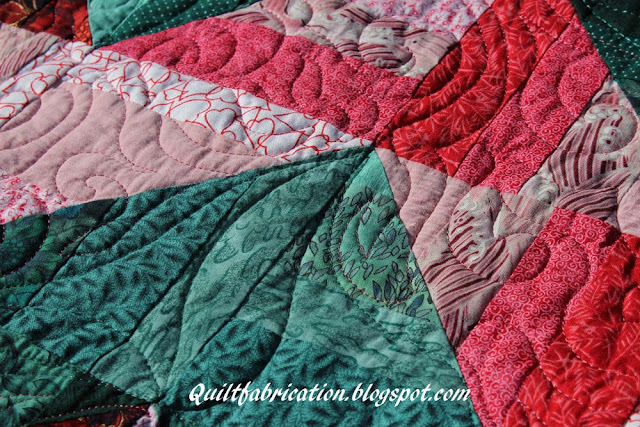 Since there is so much going on in this quilt, I kept the quilting rather simple. 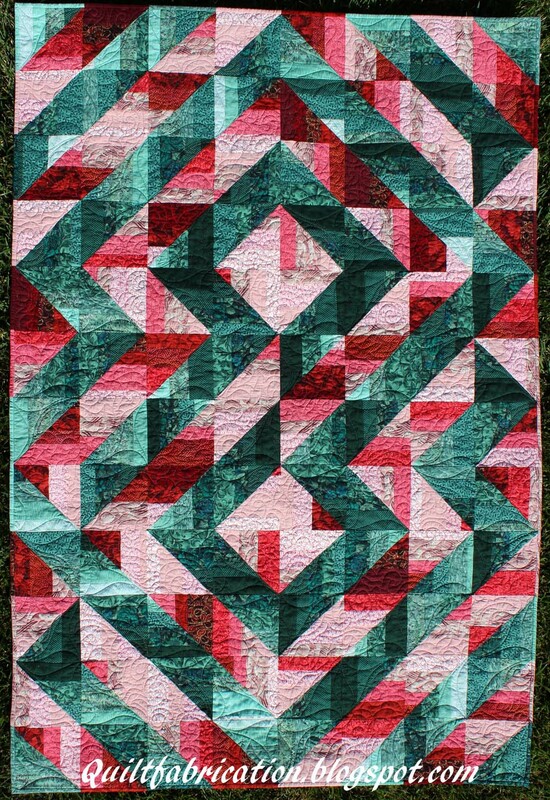 S-curves with green Glide thread were quilted point to point in the green triangles, giving it a flowing uniformity. 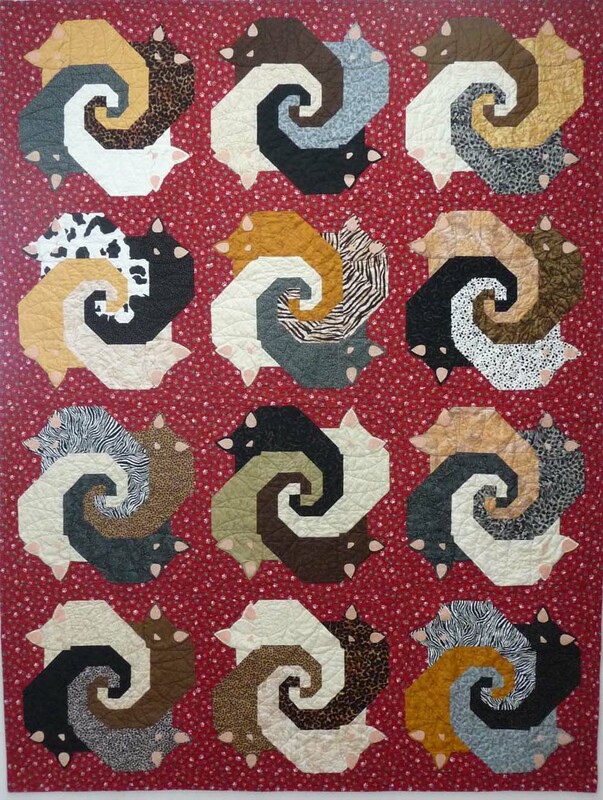 I would have loved to do feathers here, but they just didn't fit with the mood or title of this quilt. The red areas of peppermint where quilted with red Glide in a freehand swirl/point design that flowed into some green space, tying it all together. 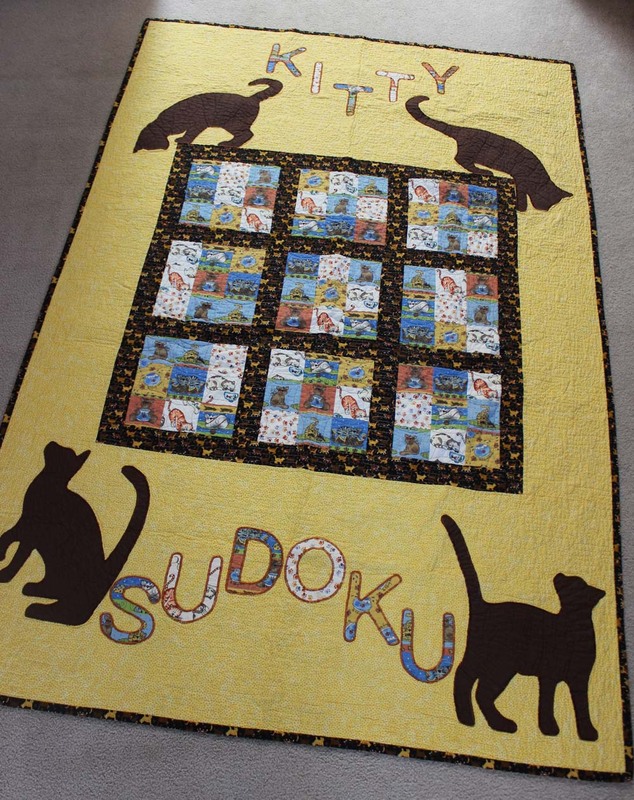 Again, it fits the quilt. I also pieced the binding to match whichever color was on the edge--red or green. Have to admit I was a bit lazy here--I did straight seams versus angled ones to match the quilt. Sometimes ya just want it done!! Now, of course I had lots of leftover strips. So last week I diligently worked away sewing them up and the result is on the frame. Quilting design will be similar to the other one, but as for a name??? Will keep you posted! 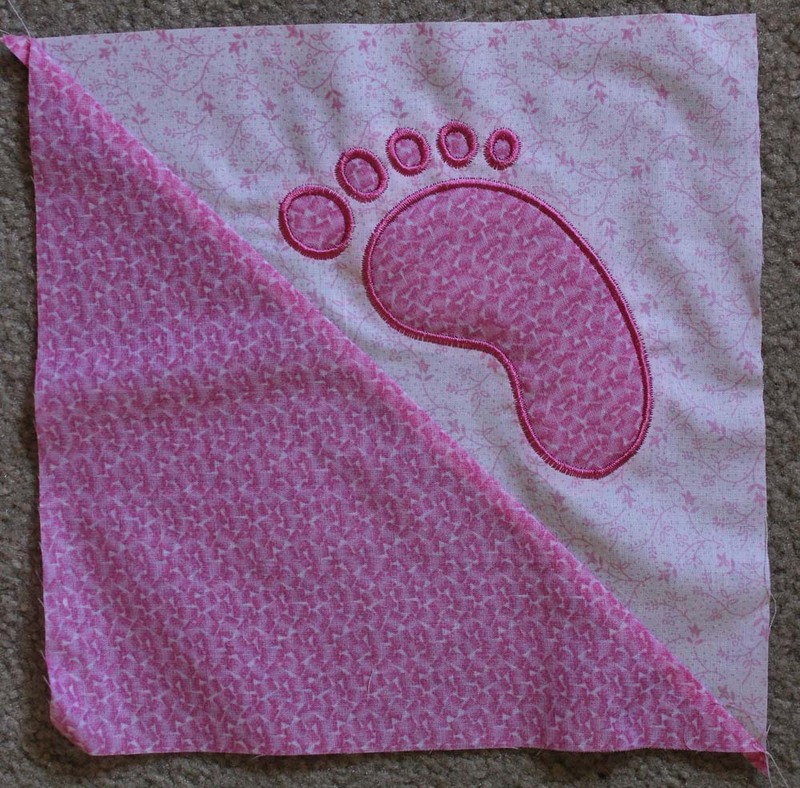 Time to explain how to stitch the evenly space straight lines on Baby Feet. my answer to perfectly spaced straight lines lay on page 20. Blue painters tape! No measuring, no marking, no worries! And it worked terrific for this pattern! 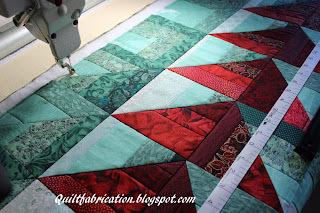 Definitely easy to use when a lot of straight line quilting is involved, as it makes the process so much more enjoyable. Here's how the pattern is set up. Always start with a starter tape, the one everything else will be based off of. Here, it's the tape that goes from the corners of the block, point to point. The arrows in the picture are on that tape, with the left side of it at the corners. Same with the last tape at the bottom left of the picture. It, too, goes corner to corner. The rest of the tapes are added next to each other, with the intersections meeting at the seam line between the two blocks. Once the tapes are set up, it's time to stitch! Starting next to the last piece of tape in the corner, the first straight line was stitched, with stitching in the ditch to get to the next tape (follow the arrow from the triangle below). 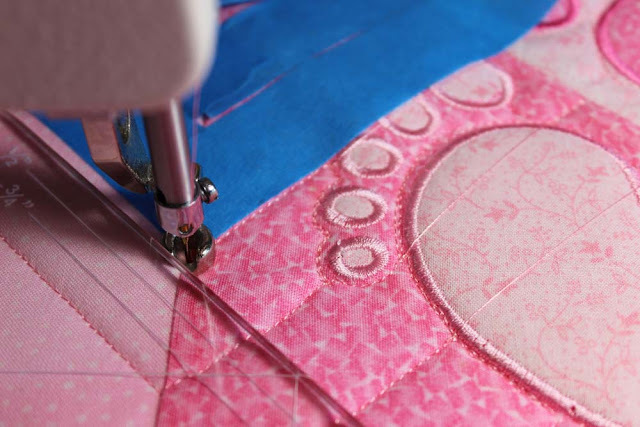 When the applique appeared, the stitching went around it and continued on. Sometimes jumping over the applique was necessary (see below). 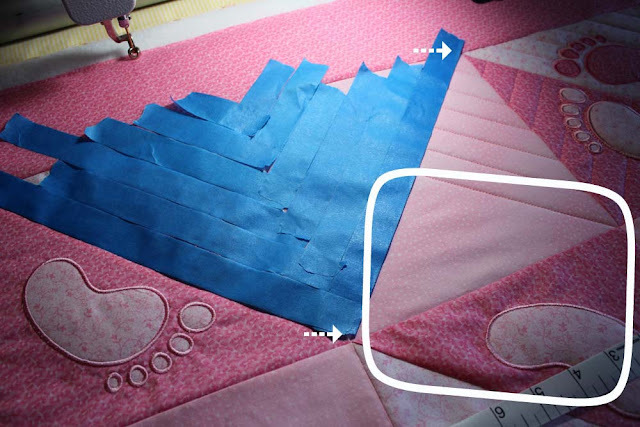 A few tiny locking stitches were taken to secure the thread, then the applique was jumped over (arrow). 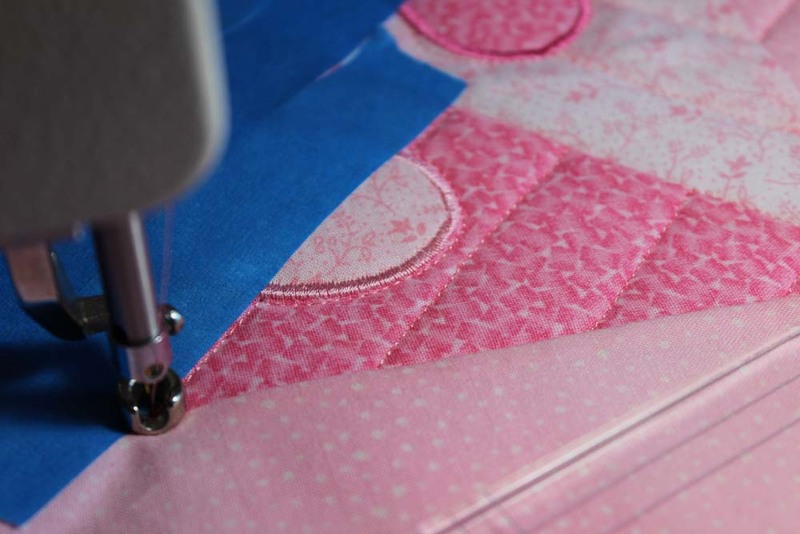 More tiny stitches were taken on the other side to secure the start of the stitching. In the above picture, the needle is now at the corner of the block. 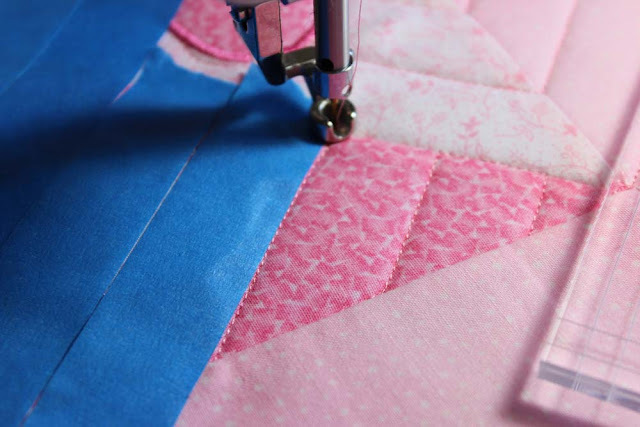 Time to change direction and stitch into the adjoining block to continue stitching the design without stopping. A previously stitched line going to the opposite corners of this block provided the stopping point (where the needle is). Stitching could go along this line to then continue along the tape, to the seam line to change direction, and continue back around the applique. Once that area was done, and jump stitches trimmed top and bottom (so they don't catch on the foot or table), it's time to set up the next tape area. Once again, the starter tape lines up with the two corners (arrows), and the others are laid against it. In the above picture, the area outlined was not completed at this time. 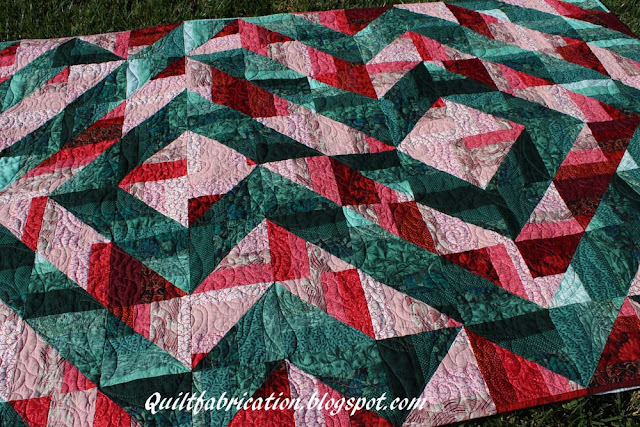 The top row of blocks were done, the quilt was advanced, then this area was done with it's adjoining block. 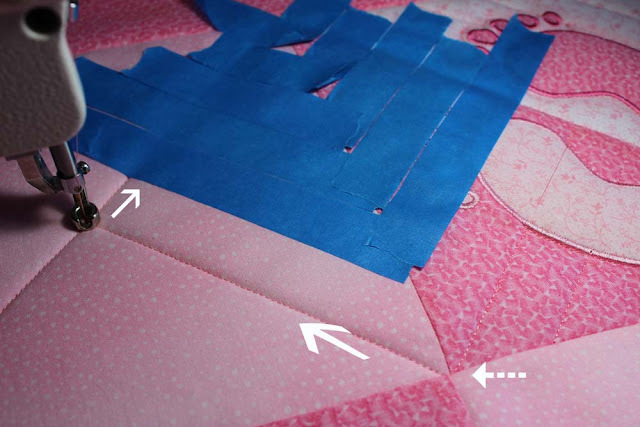 Then there would be no starts and stops in the seam lines. This may all be confusing, but with a little planning, the stitching goes quickly once all the tapes are laid out. 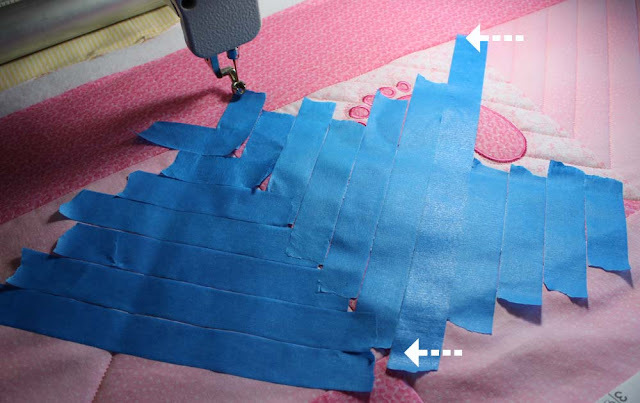 I would definitely recommend using tape when there's a lot of straight line stitching that needs even spacing. For a line here and there, probably not--I'd just use the ruler to line it up. Now I need to see what other size tapes I can find. And I'll possibly be investing in some inchie tape. 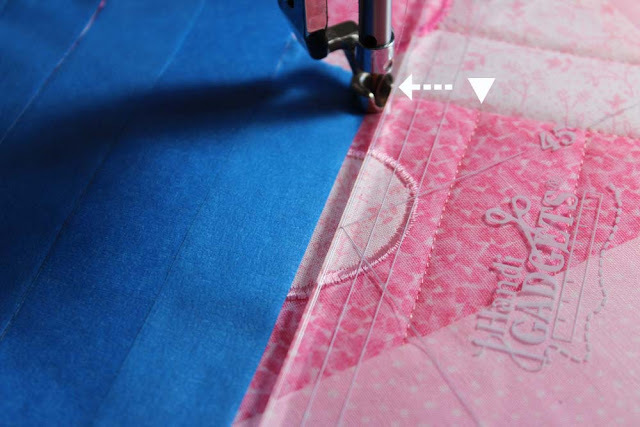 Opens up a whole new set of quilting options! My Dual Image Applique project is finished! These little feet where done on my embroidery machine, and because of the left/right aspect, were done a bit differently than the book suggests. But once that was figured out, they turned out nicely. 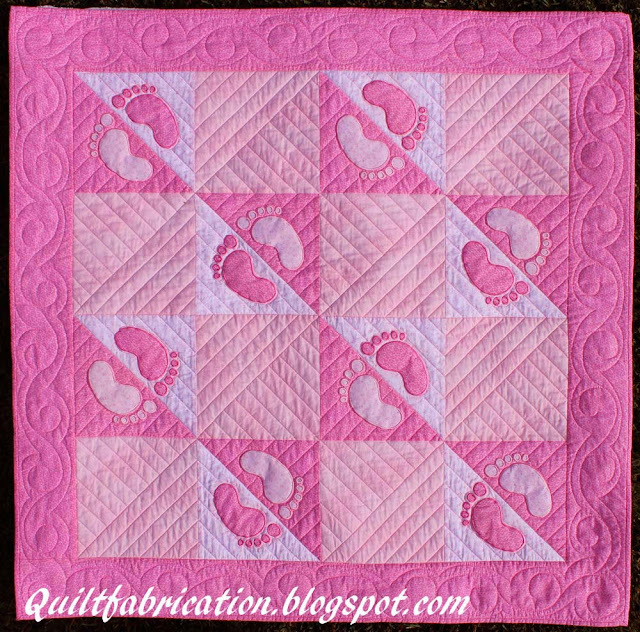 The final quilt wasn't the original layout I intended (see my previous post here), because of course, I ran out of the pink on white fabric. Fortunately, my stash had a pink that worked for the alternate blocks. I thought of pebbles or swirls, but thought the toes would get lost. Traditional echoing made the feet look like they were stomping. Different designs in the plain blocks didn't connect with the diagonals. And designs that worked through just the diagonals made the directional aspect much more prominent (see the lower right design). The border is a simple alternating swirl that is echoed on both sides. The next post will be how I stitched all those straight lines. Definitely a great technique that I will use again. Stay tuned! 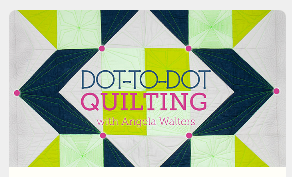 My favorite web based class site, Craftsy.com, has a new class out from Angela Walters! Yeah! Click on the picture to check it out. 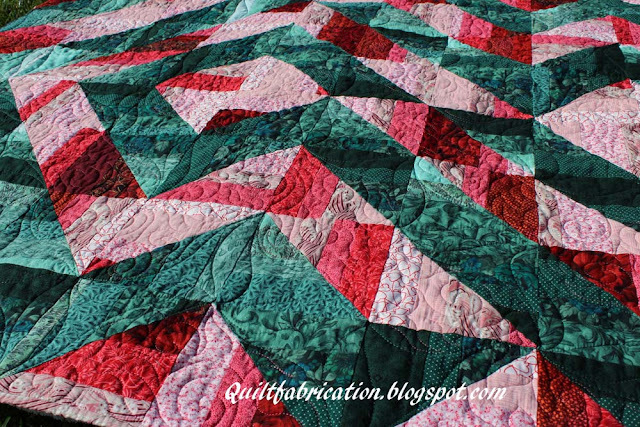 I'm a big follower of Angela, as I love both her quilting, and her awesome attitude. So I'm thrilled that she has done another class. And this one is not just for the longarmers out there--her techniques can be used for those of you using domestic machines. The designs are easy to do, and look terrific! Plus, adding fills will make them even more complex. It's all up to you! 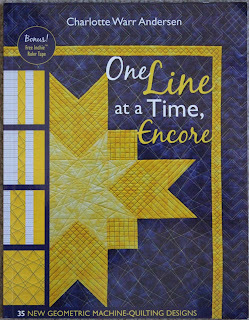 If you haven't taken one of Angela's classes (or a Craftsy class), I highly recommend them. Feel free to click on the link to sign up for her class. at lilypadquilting.blogspot.com, and thought I'd join in! 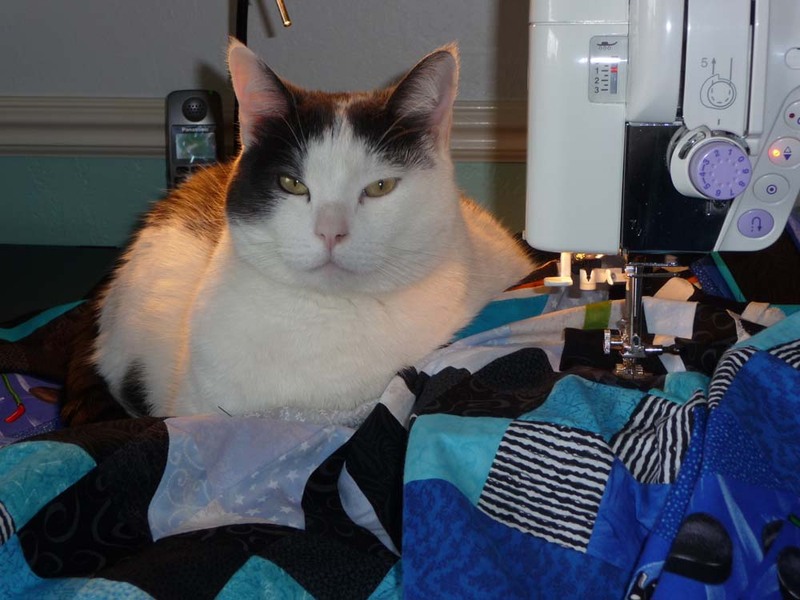 Here's my 'pet on a quilt', my lover boy, Roscoe. He is definitely the King, and certainly doesn't want to be dethroned from his spot on this quilt! I know he's been on other quilts, I just haven't caught him on camera. 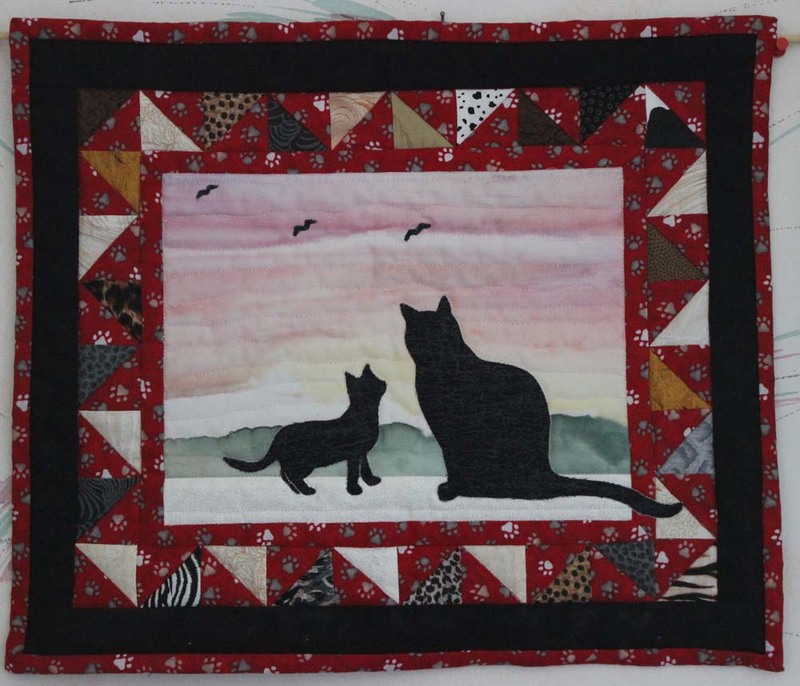 But, because I do like cats (I have three, and they all found me), I have made several cat quilts. 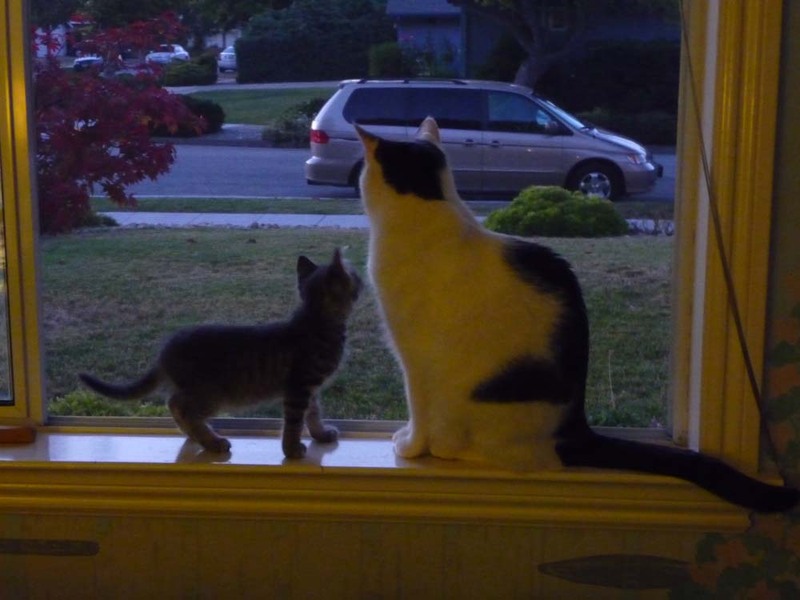 My kids think I need to stop that, or else I'll look like a Crazy Cat Lady! Anyway, here are some of my other creations. This is from a pattern Let Sleeping Cats Lie, which I made for a dear friend, who is now kittie-less. which is based on the following picture I took of the King, with Toby, a 6-8 week old kitten who mysteriously appeared in our garage. And I got my kids in on the action years ago, as this is the first and only quilt that they helped design and piece. How about you? 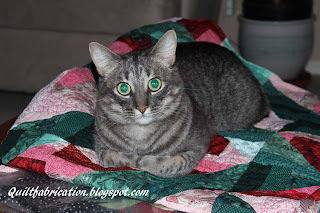 If you have a pet on a quilt, join in on the fun! You may be wondering about the coloring. 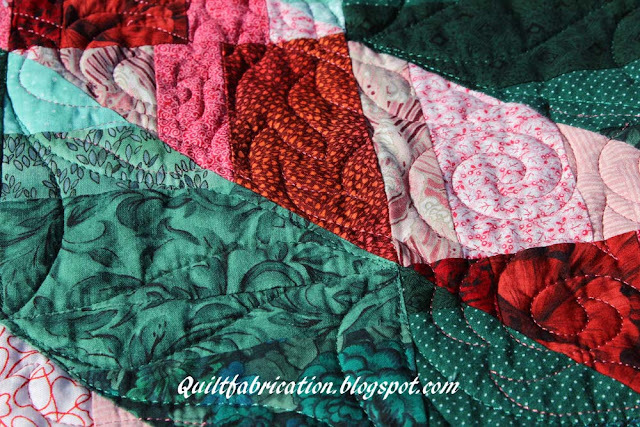 It's not meant as a scrappy quilt. It's just colored that way so that I can keep track of the left and right feet with the correct colorings. 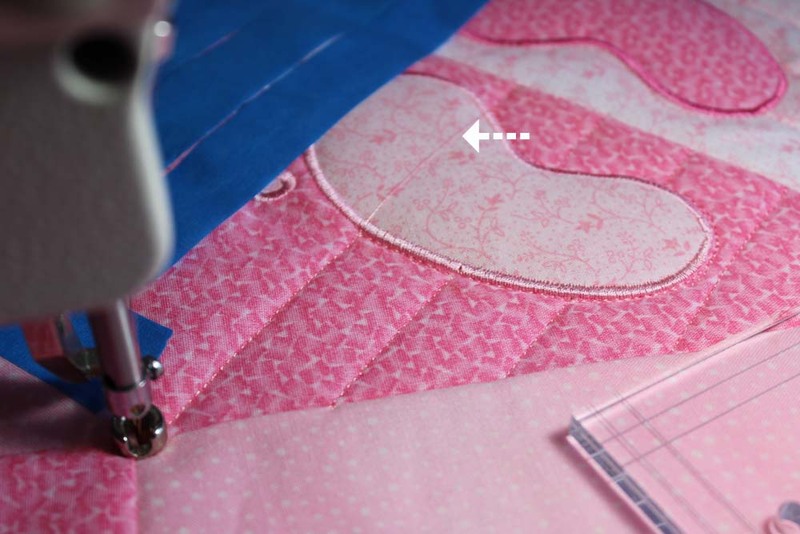 Figures I'd have to make the dual image applique process more complicated!! Eesh! 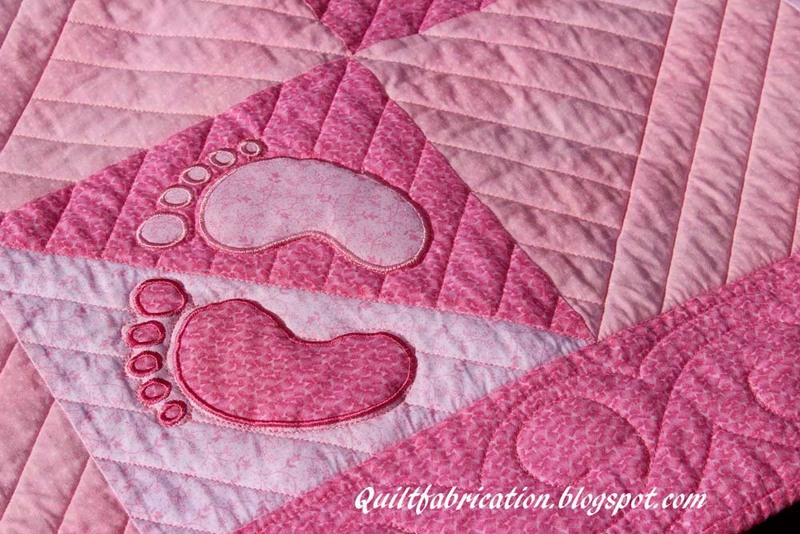 And since I'm a bit lazy, and a perfectionist, I really did not relish the thought of sewing wobbly satin stitch applique around all those toes. Let the embroidery machine do it! Prettier and quicker than I could. But then there was the time to digitize it, test it, tweak it, test it, etc, etc. And getting the placement correct, and dealing with the mirror image aspect. So I'm back at the machine until I can show you more. Can't believe it's August already! Time for back to school and a new Book of the Month! 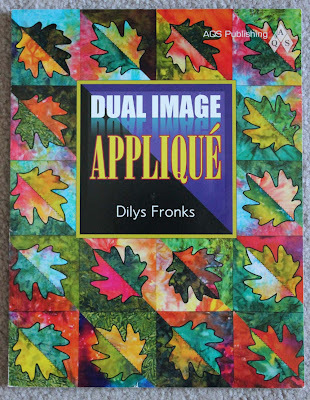 And the quilting honor goes to Dual Image Applique by Dilys Fronks. I've had this one sitting on my nightstand for a quite awhile, and need something less intense than last month. And I've already got a few ideas--just need to sit down and work them out. Should be fun! As usual, I'll post progress reports. Now, back to sewing last month's top!